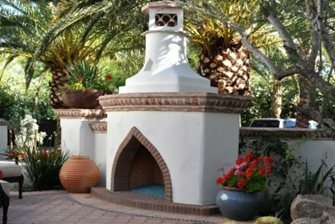 For Mediterranean style homes, stucco fireplaces offer a unique ability to bring bold color into the landscape. 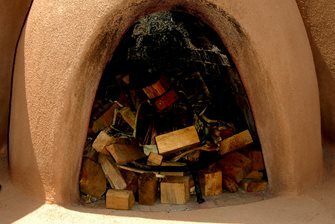 Here the choice of using stone on the hearth makes it easier to keep clean but stucco above the firebox shown here is darkening from smoke. 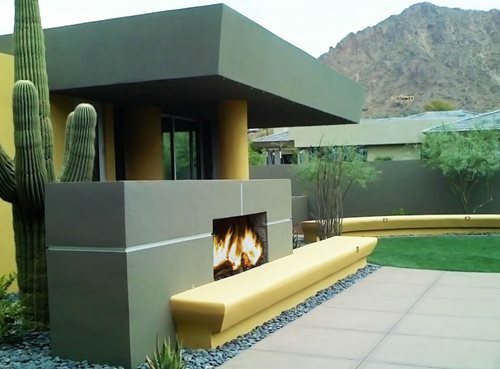 This desert modern design shows how powerful color can be when it is well selected to integrate this site in a green and golden yellow palette. 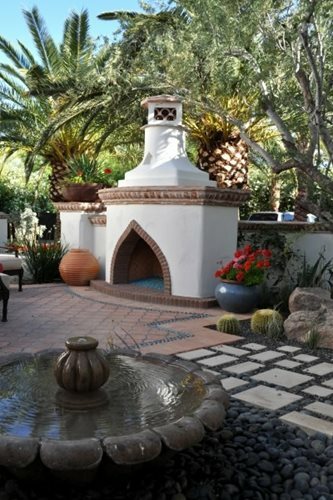 Some projects use stone and plaster interchangeably as it is done here with a custom fireplace with a strong Moroccan feel. Note the firebox opening with its pointed top which is custom and not an option available with kits. 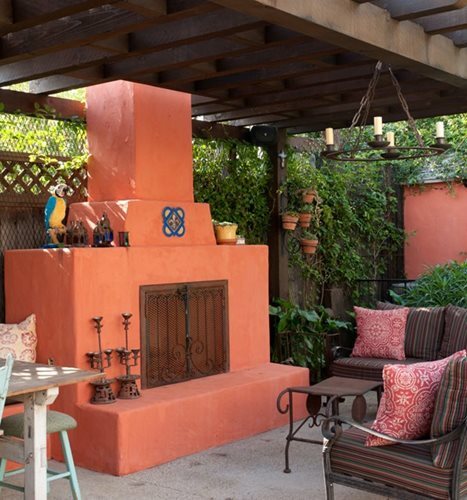 The burnt orange stucco gives this fireplace a strong presence when backed up against a Palo Verde tree. 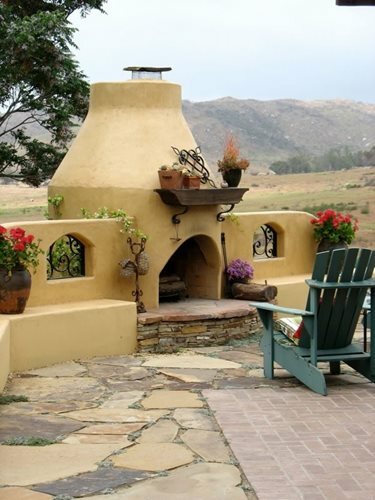 This is one of the most desirable color palettes for Santa Fe or Southwestern style architecture. 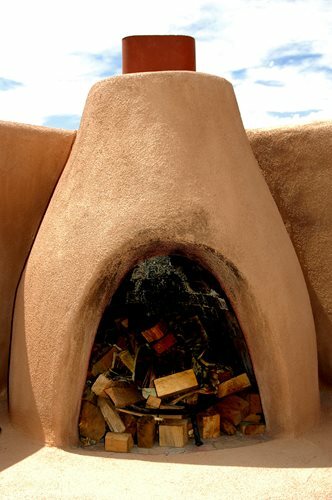 Stucco is the best way to finish a kiva fireplace which originated in adobe structures which were always plastered. Stucco proves more adaptable on some projects. 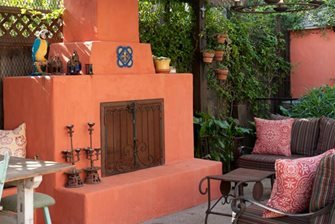 For those who love color, this beautiful fireplace with its bright Mexicolor stucco features inset tile accents and doors to close off the firebox when not in use. Is a Stucco Fireplace Right for Me? 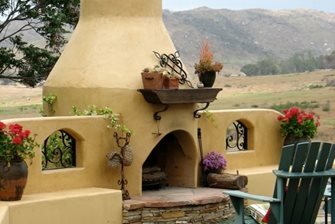 The look of Spanish, Mediterranean and Southwestern style homes would not be the same without stucco. This is the universal material for home exteriors that is just as suited to a small cottage as it is a grand mansion. What makes stucco so desirable is its easy availability compared to masonry units or stone that are heavy and may require shipping long distances. The term 'plaster' is used generally to describe material prepared with either Portland cement or gypsum. The term 'stucco' describes a factory-prepared, integrally colored finish which over the years, has come to be used to describe all colored Portland cement finishes. Stucco is composed largely of Portland cement plaster, which is a low cost durable material that can be used in almost all climates. A kit fireplace may arrive ready to receive a coat of attractive stucco. One made from scratch with concrete masonry units will require two preparatory coats before the final color coat is applied. Variations in StuccoStucco is in many ways like plaster which was at first white, and then in Mexico workers began to add blood to the slurry to give it a pinkish cast. This cast is remarkably similar to Arizona flagstone so both will often be found on the same project. This ability to color stucco means it can be used in virtually any hue imaginable. 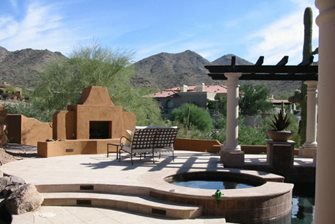 As a result the many earth tones of Southwestern architecture are achieved by creative use of tinted stucco. This plaster-like material can vary for subtly different finishes. 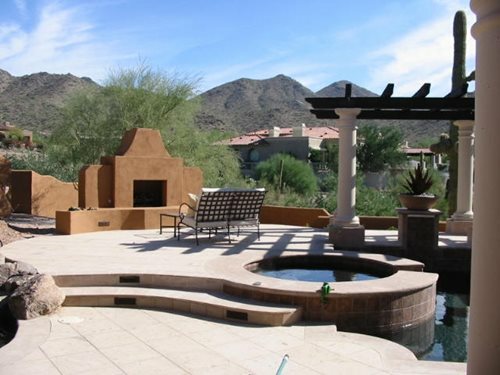 That is why an experienced local stucco company can offer the best results. For example, when the recipe uses larger aggregates, the result will be a coarse surface, while super fine aggregates may look identical to smooth plaster. A skilled stucco finisher may also offer varying textural effects both during and after the applications. There are 30 well recognized textures to choose from, but they may be considered under different locally unique names too. For example, modern design often calls for fine stucco that is even and well colored. A rustic fireplace with stone accents may benefit from larger aggregates for rough textured stucco. Stucco & SootIf you've ever seen a fireplace marred by ugly black soot from flare ups or logs that roll off the grate, you know how much the black can spoil a beautiful creation. 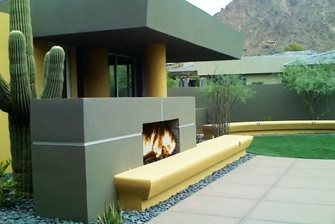 Be cautious about using stucco on parts of a wood burning fireplace that may have a lot of contact with soot and smoke. Soot can quickly discolor stucco, so for this reason, many fireplaces use stone or other materials for the hearth and other vulnerable spots. The ability to steam clean the stone makes soot management much easier in the future. Stucco is beloved by designers because of its wide range of colors. They are usually provided by the manufacturer so contractors can purchase a complete mix that's easy to work up and apply as is. Other manufacturers produce specialty colors that are mixed into standard stucco onsite. The latter is less common due to the variability of the on site mixing process compared to pre-mixed products. For new landscapes around older stucco homes, color choice is vitally important in order to match the existing stucco color on the house with that chosen for construction of a new structure. Older stucco may fade under decades of UV exposure, so it's unwise to use the original stucco color because it may no longer match. It's best to spend time to match this faded color with a new one so all the stucco work is of an identical hue.